With 114 billion minutes each month being spent on Facebook just in the U.S., it’s no wonder marketers have turned to the social network to reach more consumers. Considering marketers ability to target specific demographics, locations and user interests on Facebook, the social media giant provides marketers an excellent chance to reach their targeted consumer base. 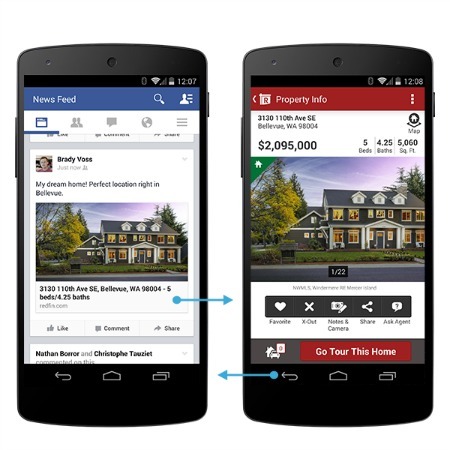 Facebook has made the process of driving consumers to a company’s app via ads much simpler with the introduction of App Links. For those who do not know, App Links allows marketers to link ads on a user’s news feed directly to a designated landing page inside a company’s own app. If users click on an App Links ad without having the endpoint app already installed, they are then automatically taken to the apps download page in their mobile devices app store. In order for marketersto be able to advertise via Facebook’s App Links, they must employ a Facebook Preferred Marketing Developer (PMD). Through App Links, marketers can drive users to their app from stories in a user’s News Feed, from a Page or even from a URL that is copy and pasted into a post.